Or I should put it in this way, 90% of them cannot stand for a meal without eating meat! "Are Boys truly harder to become a Vegetarian?" Well, the combination of "Boys" and "Vegetarian life" seems to be a mismatch. Honestly, when I first changed my diet to be a Vegetarian, I was really worried about the issue. "Will my future boyfriend not be used to eating vegetarian food for every meal, or even feeling hard to hang out with me? I have a boyfriend, and we have been staying together for 3 years. I think, what is crucial in a relationship, is that do you understand your thinking, or his/her thinking? What makes you become a vegetarian or a meat-eater? Do you know how to respect each other while acknowledging these differences between you two? We have always heard that, the way we get along with each other, especially in a romantic relationship, is to communicate, to understand, and to respect each other. This is not just about what you put in your mouth, but is about everything in life. Just think about it - if one of you likes music and the other likes to paint, would you dislike the other person despite the difference? If one of you likes to stay indoor to rest in the weekend, but the other one wants to head out for outdoor activities, are you guys going to break up simply because of this issue? I have always hearing similar things from my friends. Some people, after dating or even getting married, they start to think their partner is not the type of lover that they really want... Then I have to ask, before you starting a relationship, do you have a good understanding of yourself and him/her? Or is it just a rapid feeling and impulse, and finally breaking up because of understanding each other? He is a meat-eater. But he will have vegetarian meal with me. My boyfriend is a meat-eater, but he also like to eat all kind of vegetarian food. When we first start dating, he would always suggest to go vegetarian restaurants(Yes, he was, and "has been" so sweet and considerate. ), and we always find it interesting trying out different new places. We would also go to some restaurants which offer meat and veggie options, like our favourite Shanghainese cuisine. He always order steamed pork dumplings and braised pork ball, and my favourite are appetizers like coriander vegetables roll, sour cucumber and vegetarian dumplings. Sometimes we also love to go to noodles bar, as they also serve vegetables broth now for noodles too! One time, the last night during our trip to Paris, we wanted to try eating in local French restaurant on street (like a Parisian!). Some people might think it is impossible for a vegetarian to eat in normal French restaurant; but the key is just to get creative and make smart choices! This is what happened: he had his clams and burgundy beef while I had my grilled vegetables and french fries (although they were side dishes, they are still so delicious). For vegan, just to remember to remind the waiter, most of them would be happy to switch butter to olive oil instead for you. With great food & wine, we had a very romantic and unforgettable evening in Paris. And even now it has became our practice - everytime we travelling to a new city, we would find some famous vegetarian restaurants and try together. It really doesn't matter when you love each other! I have never forced my boyfriend to be a vegetarian, or having any negative feelings when he eats meat. Just like what I have said, don't judge, open up and try to understand each other. To respect, is always the key to a relationship. Of course, I would still hope that he will eat more fruits and vegetables, and I am always grateful every time he eats vegetarian food with me. If your partner is a dedicated meat-eater, but you want him to be healthier once in a while, why don't you consider to cook for him/her? A meatless dinner can be plenty satisfying - we love to make Thai style Tom-yum vegetables pot as main(full of different colours and nutritients); sometime when my boyfriend wants to eat some meat, he would prepare fried salmon/ chicken. To prepare a tasty and healthy meal is more easy than you think!Why not give it a go once in awhile? As long as you love each other, and with mutual understanding and respect, a relationship between a vegetarian and a omnivore could be very interesting indeed. This article is included in 《LifeStyle In White》, a book published by Charlotte In White and Enrich Publishing. It is now available at all major bookstores in Hong Kong and Taiwan. 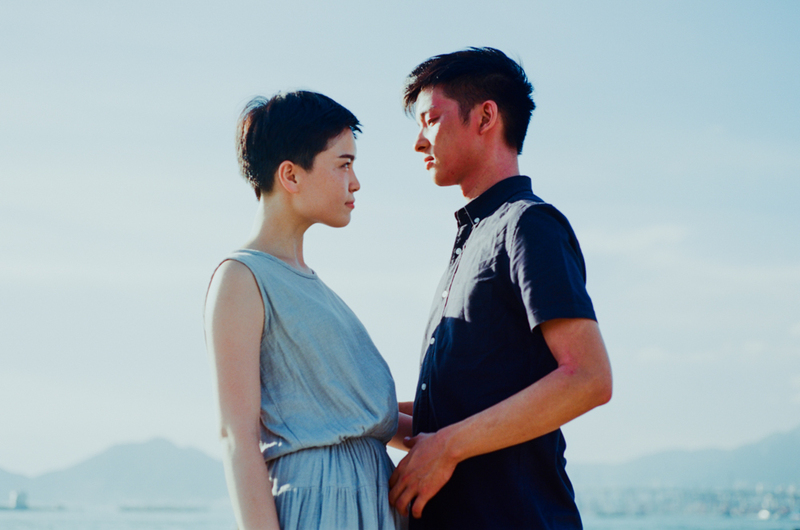 Portrait of Charlotte & Kajeng by Ocean Wong.